Life is such a fairytale when you get married. You find your soulmate and think you are going to live happily ever after like the stories. Then the bills roll in, the car breaks down, little ones come along, and suddenly your life is spinning in a million directions and spending one on one time with your spouse has long been forgotten. Bedtime doesn’t have to happen at 10pm. Send those kids to bed early. If you have little ones, even 7 is sufficient. Here are 10 tips to help your child fall asleep – and a handy bedtime chart. Your number one priority is your family. If you have to step away from other commitments in your life, do it. It can be challenging to do a date night once a week, but it is important to schedule at least once a month for a date. 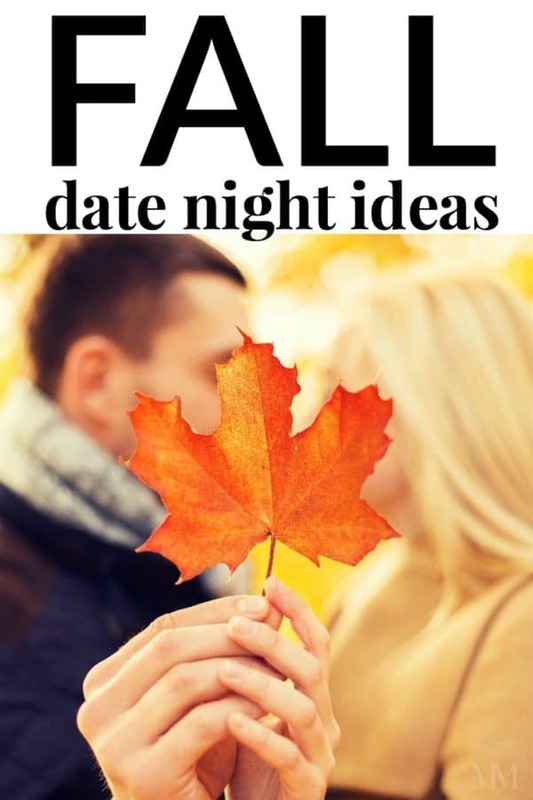 If you can’t get out for a date, at home date nights can be just as fun. Check out this Date Night at Home Kit or this fun Kisses 4 Us game. Drop the kids off at the grandparents or friends for the weekend and take an adventure to a new city or destination you have never been to. If you drop the kids of at friends, be sure to offer to watch their kids for a weekend so they can get away for their own little adventure one weekend too. My husband and I sometimes read together for 5-10 minutes in the morning before getting out of bed. I enjoy that start to the day. Spend time cuddled up in bed. Even if it is only for a few minutes, talk to each other every night before bed. Puzzles expand the mind and are a great hobby to take up together. Exercise is a great way to increase endorphins not only alone but together. If you live where there is snow, you may even enjoy a little snowball fight or making snow angels! 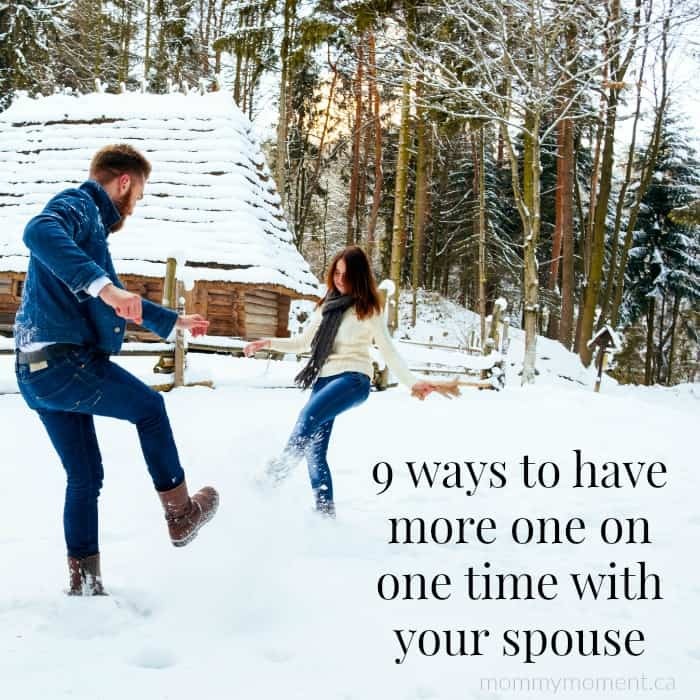 When it comes to spending one–on-one time with your spouse, you have to make the time to do it. 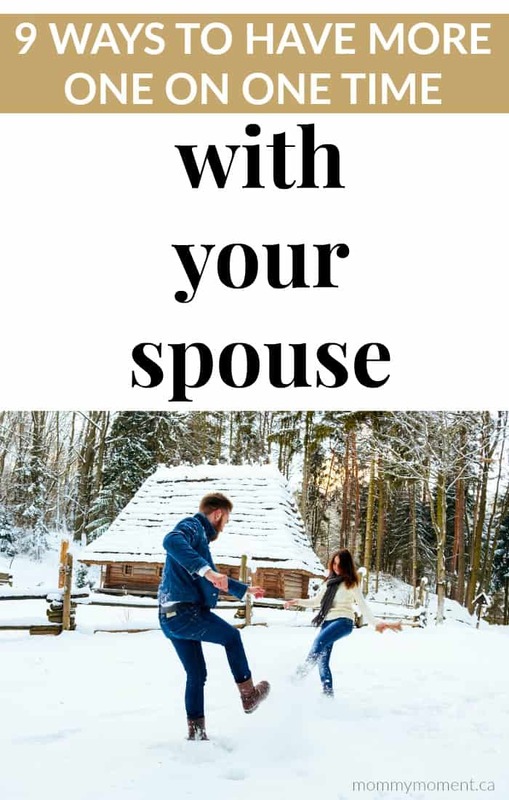 What other ways have you found to spend time with your spouse? I do, however, post tons of pinterst stuff on his fb page!! He’s got a wood shop that we tend to use more in the summer months, and I like my outdoor garden stuff!! 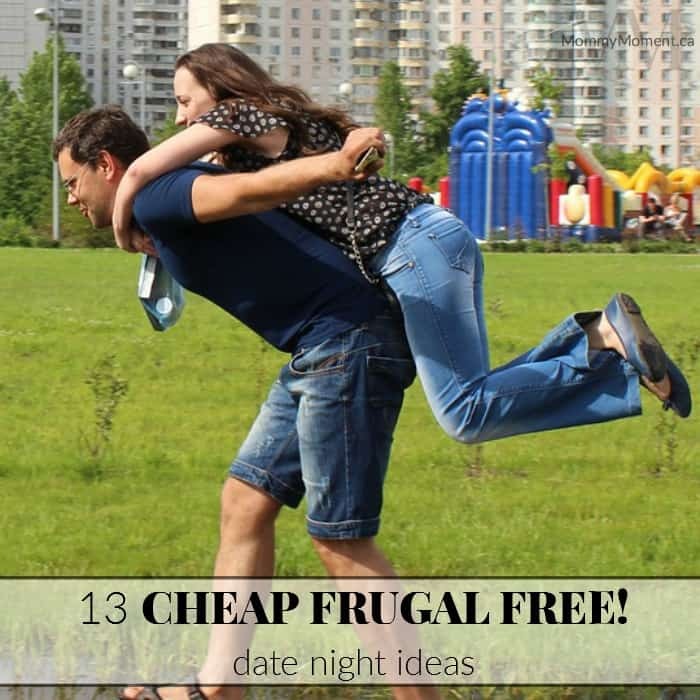 I love these ideas especially going on evening walks! We love doing that! This can be difficult for us but we try to implement strategies that allow us to spend more time alone together. With 4 kids, it’s not always easy. My oldest son is 14 so we are hoping to start taking a date night once per month as you suggested, I am really looking forward to starting that! Sometimes the little things are the ones you need the most. These are awesome ideas. It’s easy to take spouses for granted and not make time for them. These are good ideas. I’ve found that even walking down to the mailbox to get the mail together, gives us a few minutes of time together.